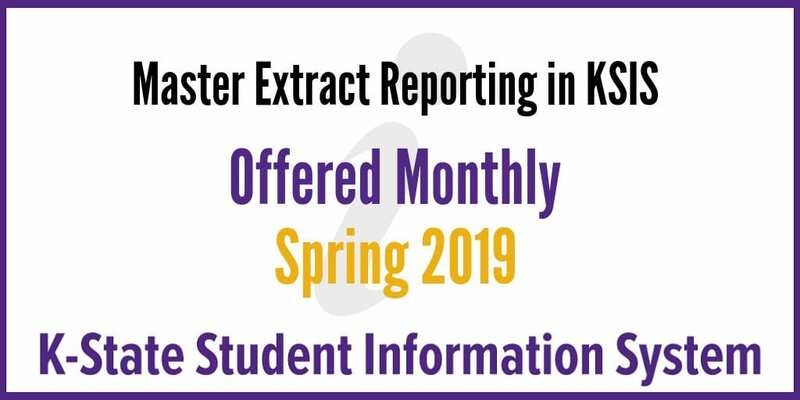 Training sessions for Master Extract Reporting in KSIS for spring 2019 are now available. The monthly sessions are only for staff who have been granted the Master Extract Reporting permission. The training schedule is set for one session each month. You must have permissions setup for Master Extract Reporting in KSIS before you can take this class. Mon., March 4, 11 a.m. – 12 p.m.
Wed., April 3, 2 – 3 p.m. Thurs., April 25, 9:30 a.m. – 10:30 a.m.